1.8 8) What should you do? 1.9 9) What should you not do? Are you a lover of woodworking? Want to make amazing things with wood? Then you must use a table saw for giving your wood a suitable shape. A table saw can reduce your time more than a hand saw. If you are serious about it then don’t be confused and buy your one for your wood workshop or you can build a saw for that you also know how to build a table saw workstation?All you just to know about that- how to use a table saw. In this article, I am going to explain the methods regarding how you can use your table saw. So get seated and start to read. All table saws are not the same. Many of them have different features but the main purposes are the same for all kind of table saw. There are many extra benefits for altendorf table saw, American made the table saw, anti-kickback table saw guard, auto stop table saw etc. for having more facilities and features. Here I am going to discuss the Methods of using a table saw. a) Blade– Yes it is the main part of a table saw. It is the cutting tool. It is round shape and having very high speed. There are various kinds of cutting blade that we will discuss later. b) Adjust the height of blade- There is a wheel underneath the blade and it is used to adjust your blade face. You can pull up the blade’s face and down it too by using it. c) Insert the Blade-To keep 1 of an 8-inch gap is an ideal gap for inserting a blade. We are very optimistic about the fact that one should keep that gap for having the best result. To swap the blades use an insert that will fill the holes. d) Angle adjustment of a blade- There is a lever to adjust the blade’s angle perfectly. For a different kind of shape, we have to angle the blade. This lever does the work for you. e) Fence- During cutting the workpiece your workpiece may misplace. The fence is worked as a guide. It keeps a certain distance from the blade to the workpiece while cutting. It is paralleled with the blade. You must know how to make a table saw fence. As it is very dangerous to work with a high motioned sharp-edged tool we have to always be concerned about the safety. A table saw has extremely high-speed motion while it cuts the wood. It looks like a bullet that goes through the wood. In such a speed you have to think about your safety. Use the rip fence always for rip-cuts. You should never keep your workpiece over the blade while it is turned off and you are going to turn in on. First turn on your blade and then start work. Otherwise, the blade will throw back the wood piece with extreme motion as it has very high speed. For cross-cutting always use the meter gauge. Keep the workpiece absolutely flat to the table while cutting. Never pull the workpiece from back to front. If you are concern about it then you can avoid kickback. As earlier I mentioned about the fence. It is used as a guide. To cut a workpiece through lengthwise is the main operation of Fence. A lever makes it happen to do so. Adjustment of the fence is very important as we want a decent cut with the blade. In which parameter should we choose to cut a fixed piece of wood is related to the fence. The fence has a smooth surface. Place your little finger at smooth surface of the Fence. And another finger thumbs into the wood piece from behind. Never place your hand before the workpiece and beside of the blade in a table saw. It may cause an accident. Push your wood back to front by adjusting the fence. It will help to cut perfectly. Three kinds of cut are available so far. To cut across the grain is known as crosscut. In fact, all the cuts that directed from the narrower side are considered as crosscut. Crosscut is done by meter gauge or by sled. A dado cut is accomplished through meter gauge or fence. It is a wide cut. There are some other kinds of blades that are used to cut more accurately. To cut down the length of a workpiece is known as a ripping cut. The cut is done with the help of the fence. To cut the workpiece by angled we can use a table saw. 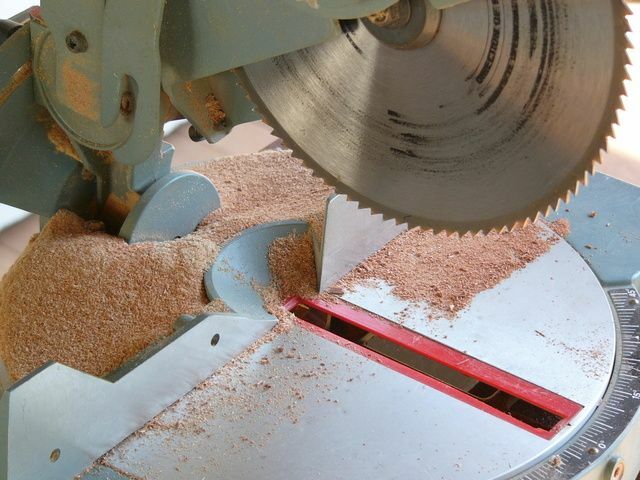 The table saws are able to cut two kinds of angled cut. First one is to cut the wood piece with the help of the meter gauge. It is related to the blade plain. To cut this kind of cut you will just make the piece suitable and apply the cross cut mentioned before. Another kind of cut is related to the plane of the table. You will have to tilt the blade over for this kind of cut. You can adjust the height of the blade as you want to cut the piece angled. There is a reference indicator in a table saw machine to cut it perfectly. For simple angled cut you can follow the methods but for a high tolerated angled cut you going to cut then the suggestion will be- use bevel gauge and protractor. It is very important to adjust blade height to cut the workpiece by using a table saw. And change the blade for getting a different kind of cut. For thick workpiece, you have to pull the blade up with the help of the lever. And for the thin planed wood piece you have to pull the blade downwards. If you do not do so then the extra part of the blade for a thin piece can create an accident. A lever is set down to the machine to adjust the blade height. All you have to just do is take a suitable height by losing the lever and tighten this after getting you preferable height. Change of blade is also very important for getting a particular shape. To change blade you have to lift it. The diameter is different for different types of blade. Sometimes the blade’s teeth can be broken. Again the sharpness of the blade can slow down. So, we have to change the blade. The current blade should be removed safely and insert a new blade with safety too. There is some maintenance process to maintain your table saw. It is a good habit to maintain your maintenance process once a week. It’s very unsafe to use it when this became too old. Dust can cover your machine. Then you have to clean the machine. The process is included in the maintenance process. You can use a vacuum for the cleaner to clean the top of the table. Check the blades regularly whether it is broken or any harm happened to it. Always try to keep your machine neat and clean for the better result. 8) What should you do? a) Use protection for your eyes and use ear protection for your ears too. Clean yourself after workings. b) Use good quality metal blade for your table saw. c) Lubricants should be used for smoothing the blade surface. d) Use a sharp-edged blade always to cut the workpiece. e) When work is done to remove the blade. 9) What should you not do? a) Do not use the metal piece to cut with a table saw. b) Do not place your hand over the blade. c) Never use meter gauge and fence at a time. This can cause kickback. d) Do not push your finger towards the blade. It is very dangerous. Here you are. Hope that you have known all about the table saw. I will highly recommend if you are passionate about woodworking you should buy one for your workshop. You can also found how to use a circular saw and router table. Always ensure the safety while working. Cut your wood and design your wood realm. Best of luck.